Pianist Anat Fort is from Israel, though she had a long stopover in New York City where she attended the William Paterson jazz school (actually in Jersey, but close enough) and played with a series of mentors (such as drummer Paul Motian) and peers (particularly her trio mates German drummer Roland Schneider and bassist Gary Wang). She also spent some years recording for the ECM record label, having made its acquaintance through Motian, where part of the aesthetic of her trio might have been honed. Colour, the newest recording from Fort's trio, is out on Sunnyside and was produced by the pianist herself. No longer reverberating in the gorgeously chilly canyons of that ECM signature sound, the band sounds more exuberant and earthy, coming more directly into your ears and soul. The tempos still tend to be somewhat logy, but their patience is soulful. For example, "Sort of" might suggest indecision, but this is a tune most certainly hitting you in the heart, injected with gospel harmony and a blues sounds that nevertheless avoids cliche as it spools toward the light. The slow tempo feels juuuuust right, and as Fort takes the first solo, it's her patience that gets you. She isn't trying to blow you away with chops or excessive blues flash. Wang follows suit, as lyrical as a bassist has ever been while still playing low and gutsy. Similarly in the pocket and grounded in a blues feeling is "The Limp", which is built on soulful bass line. Fort's melody is lilting and delicate, but it sets up a performance that is warm, rising into feeling as the harmonies surprise and delight. The trio can also pick up the tempo and play with rhythmic vigor. "Tirata Tiratata" begins with a theme made from insistent three-note descending figures played in a staccato swing, blurts of three that set Schneider's drums into a momentum that keeps the tune rushing forward. The time signature is elusive as the band pushes and pulls, lurches forward and stops for quick breaths. "Free" begins as a ruminative bass solo but soon breaks into a fast, light swing that organizes itself around a two-note figure from Fort that recurs with a whimsy that recalls an Ornate Coleman melody. The band gets a bit messier here, flexing the tempo and the texture pleasantly, then moving back to the swift swing to finish things. Not that all of Colour seems like it would not have worked on one of the trio's previous ECM outings. "Heal and . . ." has a majestic sound with mournful undertones, just the kind of thing you might have expected from Keith Jarrett during his most fruitful years. The performance is somewhat playful, with the arrangement on the first statement of the melody calling for a rondo between piano and bass, the melody being passed back and forth. Fort's improvisation develops a like a slow boil, rising in waves, rippling, mostly staying inside the harmonic framework but using slices of dissonance to create more heat. She is not typically a linear soloist, someone who drives a narrative in her improvisation with a single-note line in her right hand that unspools like a trumpet solo. Rather, she works the inside of the tune, shirting harmonies and playing varying rhythms within the groove of the tune. It is ten-fingered piano playing, even though she never, ever seems to play with bombast. It is playing that demands a careful ear even though it is usually very pretty. 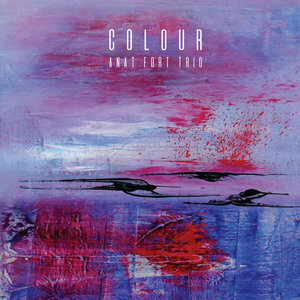 The highlight of Colour is a tune that is played twice, once by the trio and once by Fort as a solo. "Part" is craggy ballad, and the trio plays it in free time, each member of the band moving with some independence, like three soloists who are all listening but nether leading nor purely following. The solo is played sparely, Fort using her pedals to allow the instrument to ring with sumptuous overtones. The theme emerges more clearly, a mournful and simply melody that pulls at your heart. It is surely the most purely gorgeous performance on Colour. Anat Fort has built a fine string of recordings, and the latest suggests more independence from her mentors and influences. Her trio works in a delicate balance—its evolution is probably destined to be slow rather than sudden. Those influences are so strong, however, that it's not clear to me that I'd easily identify Fort in a "blindfold test". Her influences also go back a half century to players like Paul Bley and Keith Jarrett, which is not a bad thing but which contributes to the sense that her music is artistic, yes, but somewhat anonymous. She shares her influences with many other creative musicians, so the edges of this style can seem smoothed and polished. But with Colour Fort has taken a step toward more vigor and punch in the playing of the trio. It is a welcome shift.